BOYD, Linn, a Representative from Kentucky; born in Nashville, Tenn., November 22, 1800; pursued preparatory studies; moved with his parents to New Design, Trigg County, Ky.; engaged in agricultural pursuits in Calloway County; member of the State house of representatives 1827-1832; returned to Trigg County in 1834; elected as a Jacksonian to the Twenty-fourth Congress (March 4, 1835-March 3, 1837); unsuccessful candidate for reelection in 1836 to the Twenty-fifth Congress; elected as a Democrat to the Twenty-sixth and to the seven succeeding Congresses (March 4, 1839-March 3, 1855); chairman, Committee on Accounts (Thirtieth Congress), Committee on Territories (Thirty-first Congress); Speaker of the House of Representatives (Thirty-second and Thirty-third Congresses); moved to Paducah, Ky., in 1852; elected Lieutenant Governor of Kentucky in 1859, but when the senate convened was too ill to preside over its deliberations; died in Paducah, Ky., December 17, 1859; interment in Oak Grove Cemetery. Hamilton, Holman. 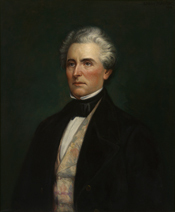 Kentuckys Linn Boyd and the Dramatic Days of 1850. Kentucky Historical Society Register 55 (July 1957): 185-95.